Pictured left: Graeme Ross, of J.G Ross Bakers Ltd and to the right is Angie Shearer - volunteer organiser of the Twilight Walk. Organisers are calling for a final few energetic participants to take part in this year’s Inverurie Twilight Walk to raise cash for Cancer Research UK. Now in its 9th year, the walk will be taking place tomorrow and hopes to raise £25,000 for the charit,y with entrants taking on a night time walk around the town centre. Event organiser Angie Shearer MBE started the walk in memory of a family member who died of cancer in 2000. She said: “Sadly, we have lost more family members since then and this year will be 5 years since my mum’s twin passed away with cancer. “As a family we would like to mark the 5 years by encouraging 500 people to sign up and for each individual to aim to raise £50 each. “This will then result in a total of £25,000. Walkers who sign up can expect some snacks along the six-mile route and even a glass of fizz half-way courtesy of Fennel restaurant. 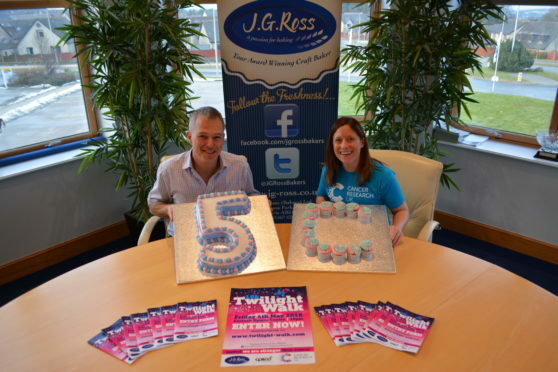 The main sponsors of the event are once again JG Ross who will also be providing sweet treats at the finish line. The event takes place tomorrow, beginning at 10pm, and starts and finishes at the Garioch Sport Centre. For more information visit www.entryhub.co.uk or www.twilight-walk.com.